Hello, and welcome by my blog today. I'm sharing a sweet little Christmas Gift Tag today that I was inspired to create by a fabulous tag made by Laura Pryor, owner of Lil' Inkers Designs. I had a similar die and wanted to try this fabulous idea. I love how it turned out, and I'm so grateful for the inspiration. 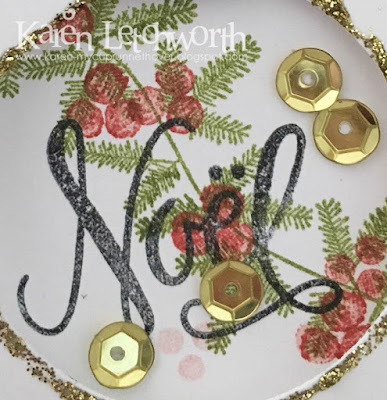 I used a Frantic Stamper ornament die to create the cut-out, cut the ornament topper from gold paper, and then I did some stamping, added some sequins in the negative space, and added a few little embellishments. I used gold Stickles around the edge of the cut-out (it got a little bit messy....lol), added a few sequins, and tied some gold metallic string at the top. The holly and berries stamped on the inside was done with PTI Love Lives Here stamp set, and the sentiment is from Scripty Holiday Greetings by Simon Says Stamp. 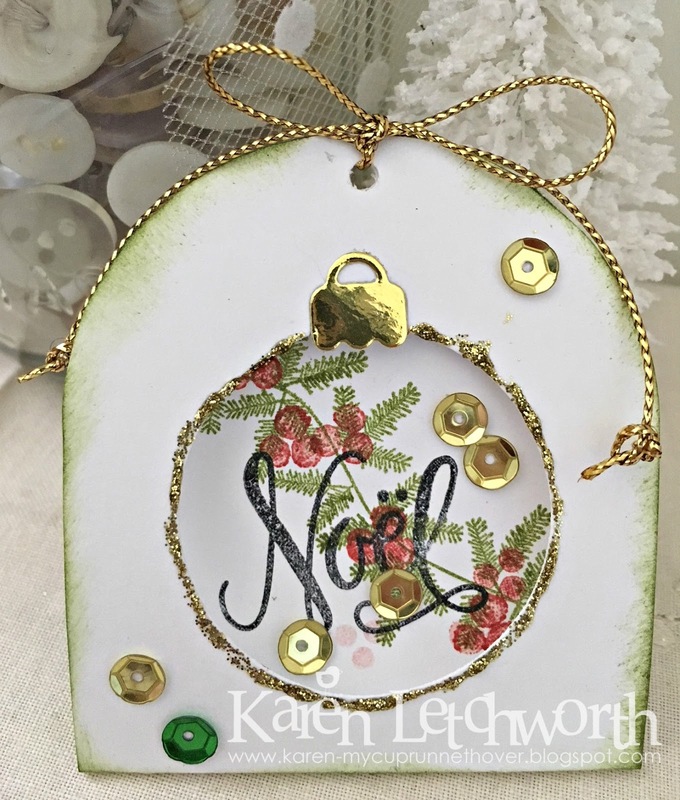 25 Days of Christmas Tags - I was inspired by this fabulous tag made by Laura Pryor, owner of Lil' Inkers Designs on Day 6 of the hop. 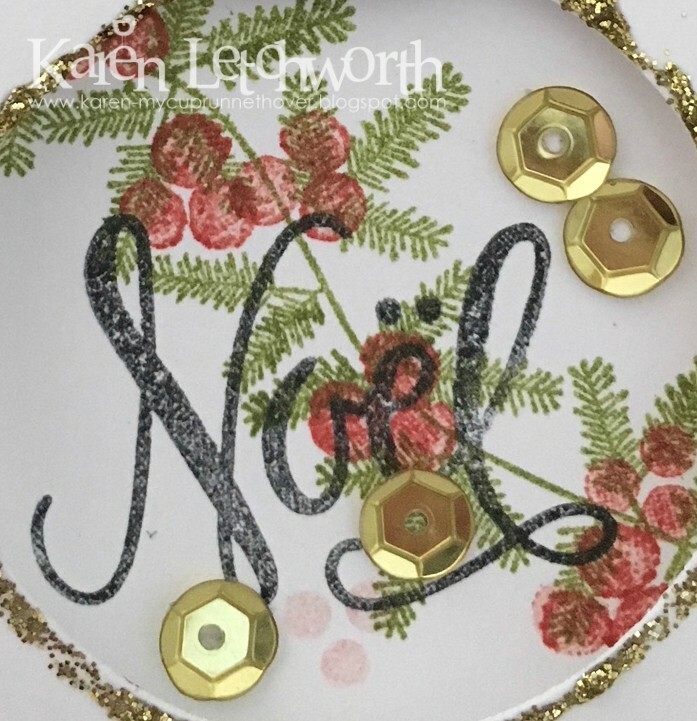 I loved her ornament cut-out idea, and had to give it a try! Simon Says Stamp Wednesday Challenge - Simon Says "Christmas Gift Tags" - I used a fantastic sentiment (Noel) from the Scripty Holiday Greetings by Simon Says Stamp. Scrapy Land Challenge Blog - Challenge #77/Anything Goes - I used a Frantic Stamper ornament die on my tag. Beautiful tag, love that you made it into a shaker tag! Thanks for playing along with us at Scrapy Land Challenges! Gorgeous...so beautiful, simply wonderful shaker! Thank you so much for joining Tracey's 25 Days of Christmas Tags. Karen, this tag is gorgeous! I love the fancy NOEL on the ornament! Beautiful Karen!! Love the fun shape of this! Just gorgeous!! Karen, that is a beautiful tag. Love all the glitter and glam. Turned out lovely and look at those gold sequins - love it! Oh how beautiful, Karen! This would be a fabulous gift--love everything about it! Karen, this is a lovely Christmas tag! I love the stamping and the glittery edge on the circle. So pretty! Thank you for playing along at Scrapy Land! Hugs!